An IOM Physician addresses TB patients at IOM Nairobi's DOT clinic. ...to set ambitious goals for TB treatment success! 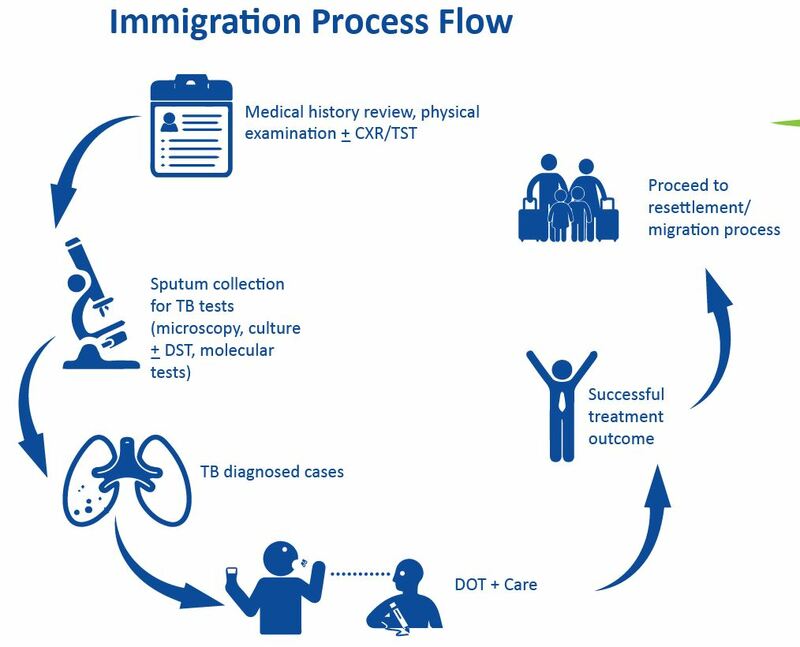 Successful treatment of TB disease hinges on directly-observed treatment (DOT) and patient-centered care and is a core part of the International Organization for Migration’s health assessments for migrants, including refugees prior to resettlement. From 2010 to 2016, IOM’s Migration Health Assessment Centre (MHAC) in Kenya diagnosed 426 cases of active TB, treating 363 of them at IOM Kenya’s TB DOT clinics, while the others were referred for treatment. IOM Kenya’s TB DOT clinics sustained high treatment success rates over this period, ranging from 90% to 100%. Such successful treatment outcomes are attributable to the clinics’ prioritization of DOT, patient-centered care, early detection, and active-case finding while conducting pre-departure health assessments for migrants. 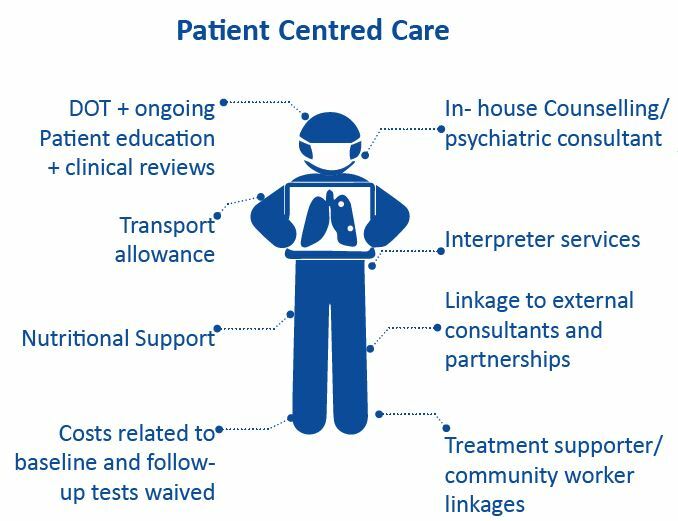 Other services that contributed to these important treatment outcomes include ongoing patient education, in-house counselling, interpreter services, nutritional support, linkage to external consultants and treatment supporters, transportation allowance, and waivers for costs related to baseline and follow-up tests. TB control in IOM Kenya’s DOT clinics surpassed targets and the clinic’s outcomes indicate that a 100% treatment success rate is possible, with comprehensive care and a migrant-centred approach. Moreover, this approach ensures that neither patients nor their households suffer catastrophic costs due to TB disease, a key element in achieving Sustainable Development Goal (SDG) 3.8 on Universal Health Coverage (UHC). A TB patient receives directly observed treatment at the IOM DOT clinic. Tuberculosis detection and control continues to be an important public health concern for both migrant sending and receiving countries, as well as for the migrants themselves and their families. IOM contributes to cross-border tuberculosis detection and control by screening migrants for active tuberculosis prior to resettlement or immigration. Within its health assessment programmes worldwide, IOM provides a range of TB-related services, including physical examination, radiological investigation, sputum smear and culture, molecular testing, drug susceptibility testing (DST), tuberculin skin test (TST) and interferon gamma release assay (IGRA), contact tracing, health education, and directly observed treatment (DOT). Tuberculosis treatment is provided either directly by IOM or through a referral system, in partnership with national tuberculosis programmes (NTPs). In 2018, IOM conducted more than 376,800 pre-departure health assessments for migrants and refugees worldwide and detected 584 active cases of TB, which translates to a TB detection rate of 155 per 100,000 health assessments. Active TB cases were either confirmed by sputum culture or diagnosed based on clinical and radiological findings. 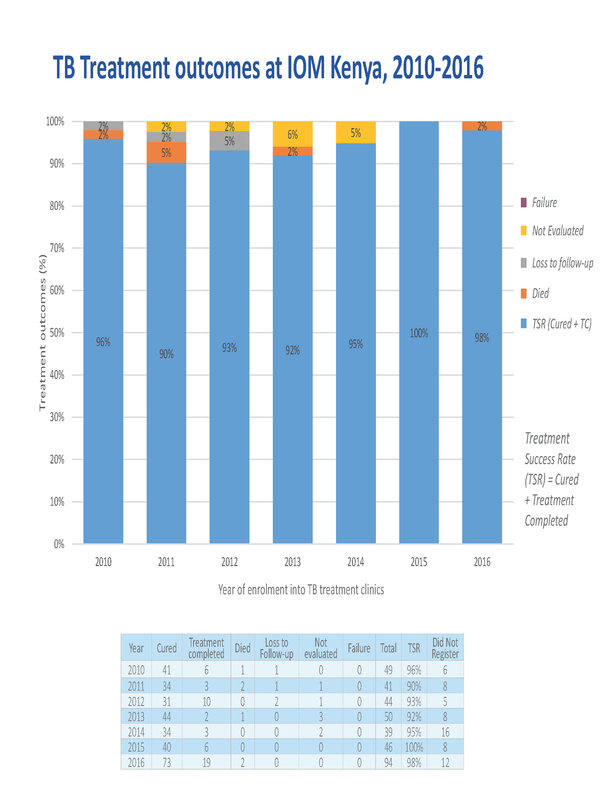 Over half of the patients with active TB were provided DOT directly by IOM, while the rest were referred for treatment to national TB programmes (NTPs). IOM procures anti-TB drugs in collaboration with NTPs in their respective countries.